One of the things that bring me joy is the unique beauty of California wildflowers— colorful, vibrant and untamable. 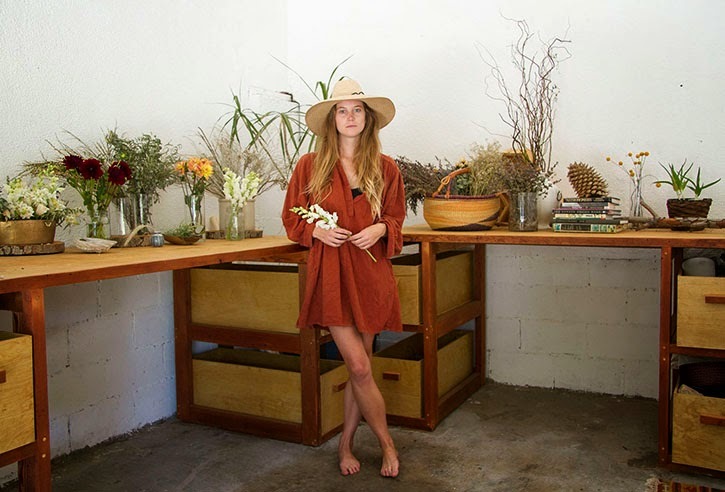 I stumbled across California based floral designer, Alice Goldsmith of Wild Vase (www.wildvase.com) several months ago, and was immediately captured by the cinematic quality of her pieces and the way she captured the landscape of California through her work— the arrangements feel untamed, wild and free. I love the way memories, stories, and the idea of "home" is infused in her pieces. Flowers are ephemeral and transient, but there's an everlasting quality to them— the smells that bring back memories, the colors that remind you of someone, the feeling of being gifted a large bouquet of beautiful roses. All those reminders that you carry within that brings bountiful happiness. Alice: I grew up in Malibu Canyon, and I've always loved being outdoors and playing with flowers. My mother is English, and I spent my summers in England with my grandmother who had a magical, lush garden. I am so fortunate to have grown up in a privileged setting with so much access to the wilderness and the freedom to explore it. After college at Wesleyan, I lived in NYC and worked in production. I'd buy myself flowers from the corner store whenever I was feeling blue. They were such a comfort to me in my small (but lovely) Brooklyn apartment. When I moved back to Los Angeles, I continued to work in production, but my heart was never fully in it. When my job working on Gia Coppola's "Palo Alto Stories" ended, I started Wild Vase as a project to fill my time as I looked for my next "real" job. As difficult as it is starting a small business, I realized that I wanted to keep doing Wild Vase. I derive simple joy from working with my hands, playing with flowers and plants. There are so many inspiring and talented floral designers, and I still find myself in awe of the work of others. "I'd buy myself flowers from the corner store whenever I was feeling blue. They were such a comfort to me in my small (but lovely) Brooklyn apartment..."
Angie: What are some of your biggest inspirations for Wild Vase? 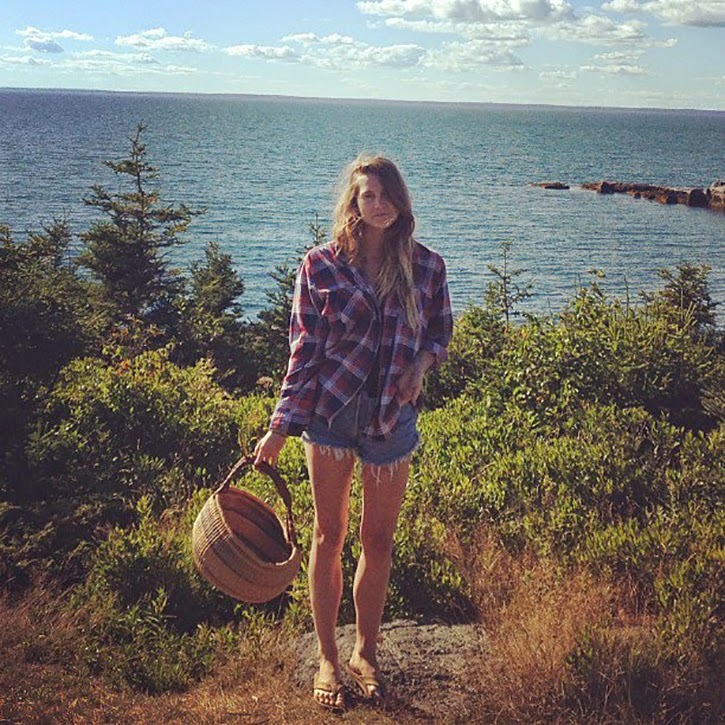 Alice: I am inspired by California. There is an air of freedom and wilderness here that makes me want to create designs that are loose and organic. A lot of people don't think Los Angeles has seasons, but I disagree. I draw upon the colors of the Santa Monica mountains-- sage in the spring, sandstone in the summer, golden in the fall, and bright green in the winter. I want my designs to reflect their landscape-- not work against it. To me, floral arrangements should just be an extension of the world happening outside the window. I am also endlessly inspired by my friends and family. For Valentine’s Day and then Mother’s Day, I named the different flower options after my three sisters and then my mother/grandmother, respectively. "I want my designs to reflect their landscape-- not work against it. To me, floral arrangements should just be an extension of the world happening outside the window. " Angie: Tell me a little bit about your design process? 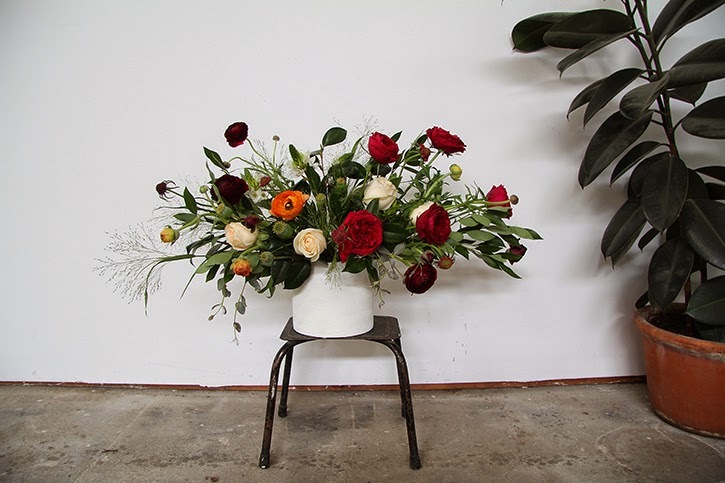 How does inspiration transform into a floral arrangement? Alice: I want the flowers to reflect my style, but also represent the client. I start with color inspiration, and then build out the texture—and then I try to make sure there is at least a faint scent. I really believe that because memory and scent are so closely tied together, all my arrangements should have some subtle notes so that the client can be reminded of the arrangement for years to come. In that way, the ethereal becomes everlasting. Going on a foraging hike or to the flower market are the easiest ways to spark my imagination. You can see and smell and feel (gently!) all the options. I try to mix textures and colors organically—flowers and foliage that could grow next to each other. Alice: Wild Vase is all about the absurd abundance of California and how lucky we are to be a part of it. I want my arrangements to reflect the seasons and the landscape outside. Even if I make an arrangement that looks more like a Dutch still-life, I’ll add some wild sage or Eucalyptus to keep the flowers weighted in Los Angeles style. I am very lucky to have the lifestyle I do, and I try to make the most of it. I spend as much time outdoors as possible. Because Wild Vase is a small business (and I didn’t get into flowers for the money), I don’t quite have the funds for extravagant trips although I suffer from wanderlust. But there are a million places to visit right outside of LA—the San Gabriel Mountains, the Channel Islands, Joshua Tree. You can play in snow and surf in the same day. I am able to live such a rich life here—and I want Wild Vase to reflect that same affordable richness. Angie: Describe one of your favorite projects & why? What is the story that you were trying to tell? Alice: I had a really lovely Mother’s Day this year. I wanted my flowers to be a reflection of my mother. She is from England (and still quite English), but she’s lived in California for more than 30 years now. She’s adopted the freedom of Los Angeles, and as she says “has learned to love the landscape here.” But she still keeps a traditional garden with gorgeous roses and sweet peas. So this Mother’s Day I was able to draw upon her for inspiration—making somewhat hippie arrangements with a English garden feel. She is also an artist and was an art teacher for many years. With that in mind, Wild Vase donated part of the profits to the art program at the Downtown Women’s Shelter. "I think “finding happiness from within” means being honest with yourself about what actually brings you joy on a day to day basis. I find happiness to be elusive, but it’s true that only you can really bring yourself happiness." Alice: I think “finding happiness from within” means being honest with yourself about what actually brings you joy on a day to day basis. I find happiness to be elusive, but it’s true that only you can really bring yourself happiness. In terms of my work, I’m grateful to have a reason to get out of bed and a chance to play with organic materials. I also find happiness in the moment that I get to hand over flowers and make somebody else’s day. Angie: How important is it to work with seasonal, local, organic blooms? 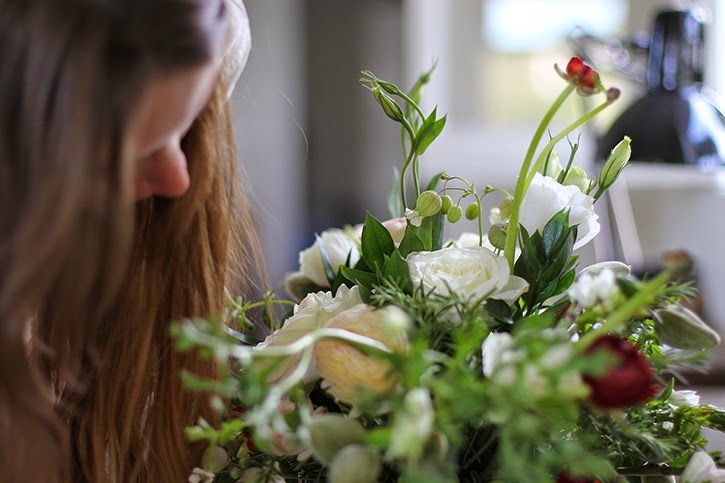 Alice: Working with seasonal blooms is important to me, because even beyond the fact that it’s better for the earth, the flowers are fresher and speak to the moment. I enjoy the challenge of arranging in the depths of winter. 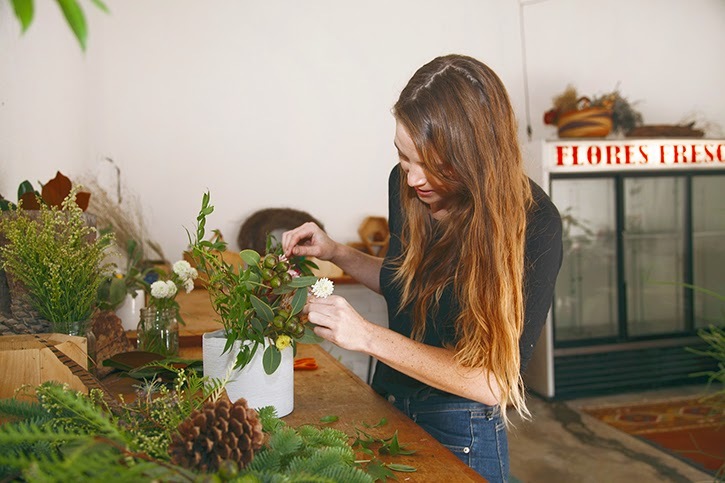 I use flowers grown outside of LA, and I try to use organic blooms whenever possible. Angie: California plays a huge influence on your work…how so? What is the California “aesthetic," and how have you melded that with your English inspirations? Which flowers are uniquely Californian vs. English? What are the different moods that they capture? Alice: California is modern, wild, free, and grand. There’s a sense of wilderness and adventure here that I love. The aesthetic is funky, accepting, and natural. I’m inspired by the lushness of England, and I want to show that with California colors and texture. I think of garden roses English flowers, and I use them all the time. Succulents, cacti, sage, eucalyptus, all have a more California vibe. Garden roses speak to tradition, class, elegance—all good things. But those traits become even better when mixed with the untraditional and the bohemian. "California is modern, wild, free, and grand. There’s a sense of wilderness and adventure here that I love." Angie: As a small business, it's important to be present online, but also be able to step away to have the time to create and be inspired by what's around us. Now that your passion has transitioned into a small business, how do you keep a healthy balance between being offline & online? Alice: I try to break up my day so that I arrange in the morning, take care of computer business in the afternoon, and go back to brainstorming or designing at the end of the day. Alice: Daisies—they’re happy and simple, and they were my favorite flower before I knew a $4/stem peony even existed. Alice: Summer—the days are long and everyone becomes a kid again. Or, I do, at least. Alice: You know when you smell a warm, ripe peach? Is there anything better? Angie: Things that make you happy. Your favorites. Alice: You know what—I’ve been seeing a lot of whales of the coast this spring. And I can’t help thinking that I am in the .000001% of humanity that will ever see a whale. How amazing and lucky is that?Other things that make me happy are obvious: family, friends, avocados. Also—when it rains on a Sunday. It’s the luckiest feeling. Angie: If music/song represented your work. What song? Alice: That’s tough. More than any song it’s any podcast—I work alone a lot so I’m pretty familiar with most podcasts. I feel like I’m in a relationship with Ira Glass.